I have done rust repair before. Since the truck (04) only has 94,000 miles. I want to repair this rust. Grinding it down, and painting it is not a problem at all. I did that many many times over on the previous 93 Jimmy. But it obviously kept coming back. I was reading many posts about treating the area after with rust preventor. And also coating the bottom inside the doors to prevent moisture that gets into the doors from getting to it. What would be a good product to use on the inside of the doors, and also a good product to use once I have wire brushed/ ground the rust away? I have seen some sites say Chassis saver for the inside of the doors. I have some Chassis saver to do my doors and rock rails as soon as weather is good outside for awhile. This is a HUGE challenge on these trucks. You're right, in my experience, on our trucks, the weak spots for rust development seems to be the leading edge of the hood, and the bottoms of the doors. I've not seen too much rot in rockers and 1/4 panels fortunately. The issue is with the way the door skins are attached to the door shells, and the hood skin on the hood chassis. The problem lies in the fact that the outer panels are folded over the structural part, and GM did a poor job of applying (any?) weld through primer or other preventative measure to protect the base metal in those pinch joints. Combine this with the fact that the doors are actually designed to allow water inside them (that's what those little holes at the bottom of the door are for) and you have a recipe that ultimately results in corrosion between the shell and the outer panel. The truth of it is, once the corrosion has started, there is really very little that can be done to stop it, because accessing the area where the issue originates results in the destruction of the door skin. You can grind it down, and hit it with a rust converter, inside the door and out, but at best, that'll only slow the advancement. Just make sure that if you do get inside the door and put something down in the bottom of the door, don't let those drain holes get plugged. You'd be shocked how quickly the door will fill up with water. I'll echo Ziggy's comments, that is essentially what my body shop said. When I got our Envoy @ 60k miles the rust spots where just barely starting on the bottom lips so I had the shop touch up all the doors, hood and tailgate. The shop said get it Crown undercoated. After cleaning the metal, I like to use Por15 paint on steel frames and such. I've used that paint for quite a few years now on a variety of metal products and that por15 paint is almost bulletproof. A bit expensive, but well worth it. I ended up getting the "all too common" corrosion buildup in the inner lips of my 17" aluminum rims. A friend of mine works at a local tire shop and I had him remove the tires and wire-wheel the inner lips to remove all silicone and other adhesives. I then cleaned the insides with lacquer thinner and applied a coating of Sharkhide Metal Protectant on the insides. Again, expensive stuff, but there has been no corrosion buildup since applying it. It works on other metals too, but I prefer to use it on aluminum and stainless steel. I know that it is impossible to stop it all together once it has started without complete removal of the infected area. It is not bad so I am hoping I can remove as much of it as possible down to bare metal with a drill and a wire brush or mild grinding wheel. If I can slow it down as much as possible, I would be happy with that instead of letting it run free and take over as fast as possible, especially since it is under 100k miles. The por-15 on the inside should prevent water from getting access to the rust for the most part, then using 3m seam sealer along the bottom seam afte cleaning and then por 15 over that I think should slow it down quite a bit. I did some more reading and it seems like after searching a LOT of 04 TBs were the topic of this problem. 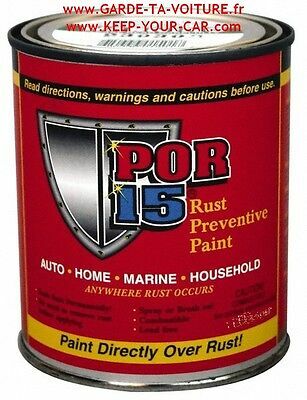 There are cheaper alternatives to Por15 paint, but I have never tried/used them. My local autobody supply shop sells about three other brands and they're basically a Black Epoxy Paint. A few of them are about 1/2 the cost of Por15 and claim the same results. I'll stick with what I already know though. ...just my opinion. 1- Could not re-open the can due to paint residue that was left on the lip, which dried and bonded the lid to the can. 2- The rest of the paint inside had dried and formed a really nice chunk of a durable rock inside of the can. I am going to use it pretty quickly, going to do under body parts as well. The reason I want to go por-15 is because it has the tri-coat which allows you to paint with any type of paint over it without an issue. I do appreciate how helpful this forum is. Great community. I did receive some of their degreaser before, but I usually just pour it into a spray bottle of Greased Lightning Cleaner & Degreaser and mix the two. Yes, I know they shouldn't be combined, but it works fine for me. I do use Por-15's metal prep after everything is sanded and cleaned. I've ordered a few larger kits from them in the past and I still have quite a bit of the metal prep solution left over. I've even used it on some other paint jobs that I've done that didn't include Por-15. It's good stuff! There are however many other metal prep brands out there that you "probably could" use if you were stuck and didn't have a specific brand that came with a specific kit. When using Por-15 paints, it's highly recommended that you open the can and stir it, pour out what you need into a plastic mixing cup (that's made for paint), thoroughly clean the lip of the paint can and lid, then immediately re-seal it. That stuff dries to almost a bulletproof-like consistency and will permanently seal the lid onto the container if any of it is left there to dry. Ask me how I know! I literally had to open a few cans of por15 with an old fashioned Can Punch/Opener to get to the remaining paint because I didn't properly clean the two when putting the lid back on, and they fused together. Seriously! If the lid is off for too long, air/humidity will get in there and begin the curing process, even after the lid is re-applied. You'll soon be buying more because you'll have a solid block of paint in a can! X2 what hockyman said! Por-15 is great stuff, but it takes a bit of care to do it right. I'd recommend trying the Starter Kit to learn how to use it before shelling out for the full containers. And if you have any problems, reach out to them, they have excellent customer service.